My wife has been after me for some time to increase my output of 5 string bluegrass fiddles. (She’s probably right, but there are so many other things to do!) So…what to do? I made two new molds, a little broader in the middle bouts, which may improve the sound even more. I installed blocks in both molds and hope to build one five string fiddle of Oregon Myrtle-wood with a Port-Orford Cedar top, and another five-string fiddle of figured maple with a spruce top. So: I have bent the ribs for the figured Oregon Mytrle-wood/Port Orford Cedar fiddle, but still have to join the plates both front and back. I installed the center bout ribs last night, and hope to get the upper and lower bout ribs installed today. Wood for Myrtle/Port Orford Fiddle with Douglas Fir Tree. There was a hard East wind blowing, and the ribs kept blowing away. 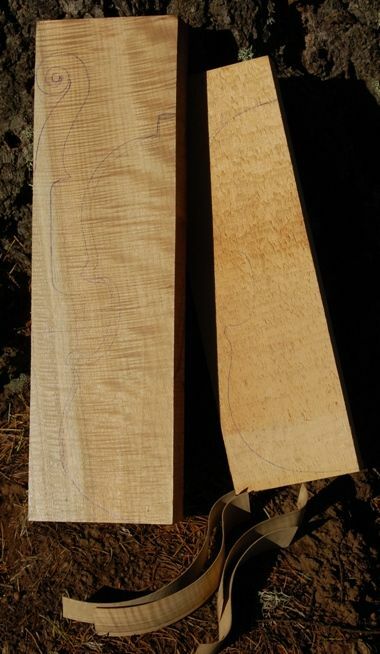 The plates for the Maple/Spruce fiddle are already joined, but the ribs are only cut– they still need to be thinned down to 1mm and cut to 35mm width. If I can get that done today, I will heat up the bending iron and try to get the ribs bent, and the c-bout ribs installed. After that I can work on getting the willow linings cut, bent and installed. 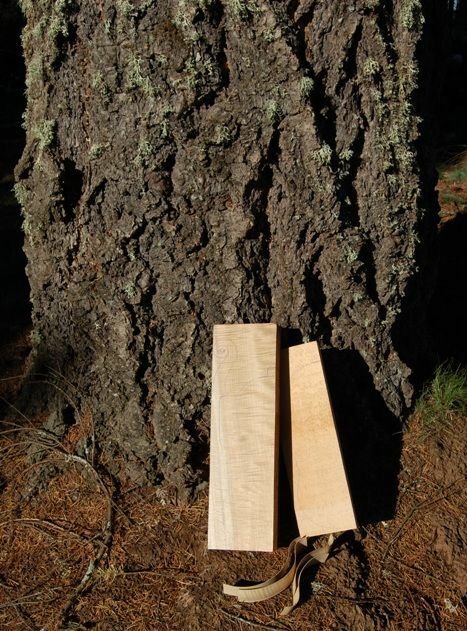 Both fiddles need the neck-blocks cut to shape, to prepare for carving. Neither have any plate-carving done, nor purfling, f-holes, etc., of course. Follow along as I complete the builds. If you decide you’d like a private look at one of them give me a call or an e-mail. One drawback to the competition goal is that (I think) I will not be able to post progress reports, (photos, anyway) until after the competition. Ah, well… I’ll post other stuff, I guess.